Eurostar will always have an air of romance for me – the first holiday I took with my husband was by train to Provence. Back in 1997 before budget airlines had got off the ground, if you didn’t drive across France, taking the Eurostar from London and changing to a TGV service in Paris or Lille was the way to go. Whilst budget flights now operate daily to nearby Nimes and Marseille, travelling to Provence by train still holds huge appeal – it’s nostalgic, can be relaxing – but changing trains with heavy holiday bags is off putting if you aren’t seeing lower costs to make up for the inconvenience. So when I heard about direct Eurostar services opening up to Avignon, I knew this could make train travel from the UK to Provence much easier. The journey, at speeds of up to 300 kph takes under six hours but thus far weekly Eurostar Avignon direct services have operated only in peak season. For 2014 Eurostar have opened up ticket sales earlier and added extra weeks to the timetable, now running from 28 June to 13 September. If demand grows as expected, Eurostar are planning a year round service to Avignon from 2015, making it easier for holiday makers to explore the region. 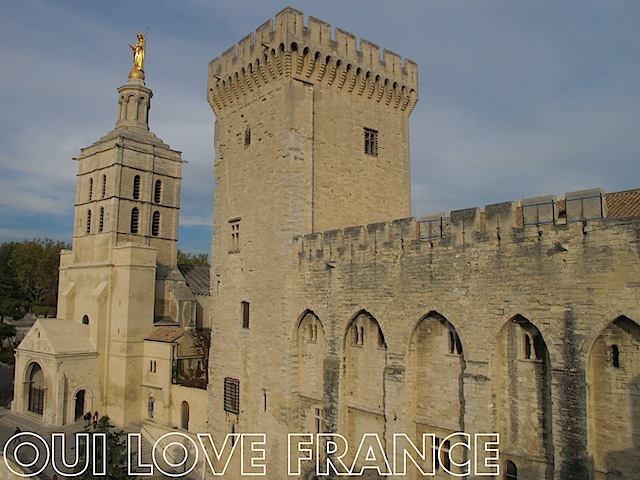 Avignon is a gateaway to a holiday in Provence. Notable local attactions include the Palais des Papes (pictured), wine region Chateauneuf du Pape and the rolling landscape of the Luberon. We’ve found nearby town St Remy-de-Provence a perfect base for exploring both the Vaucluse and Bouches du Rhone areas of Provence. There are many advantages of direct Eurostar services across France over air or road travel; no need to check in luggage, being free to stretch your legs on the train. Not getting stuck on the motorway nor hunting down decent loos in service areas scores points over driving too. Both parents can give kids their full attention on the train – neither parent is driving, no one is trying to read a map. But what about price? Eurostar direct tickets to Avignon start from a competitive £109 return per person – it’s hard to beat that by air during school holiday periods. And even if you have time or inclination to drive, the final price for a family of four including ferry, petrol, motorway tolls, meals and overnight hotel costs each direction en route to the south of France can easily hit £500. The direct weekly Eurostar Avignon service is available throughout summer from only £109 return in Standard class and £249 return in Standard Premier. If direct services are full, Eurostar offers connecting services all year round which arrive into Avignon TGV station, located just outside the town centre. Tickets for the connecting services are available from 90 days in advance of travel from £119 return in Standard class and £239 return in Standard Premier. Eurostar customers can also take advantage of a deal with car rental company Avis comprising exclusive rates and an on-board car hire check-in process to help avoid queues on arrival. Tickets for Eurostar’s Avignon direct summer services are available from www.eurostar.com, by calling 08432 186 186, at Eurostar stations or from travel agents.